There are many parts of Nepal into which the entry of foreigners is strictly controlled. Many treks that may be suggested on a map are in restricted areas and you either cannot get a permit for those regions or must travel with a liaison officer and pay for a special permit. Some areas specifically closed to foreigners are: Walunchung Gola, Rolwaling and the route to Nangpa La in Khumbu. When planning your trek, assume that these areas will remain closed. Don't count on a last-minute change in the rules. Police checkposts are numerous in the hills and police will turn you back if you try to trek into a restricted area. Officially there are no longer any restricted areas in Nepal. The immigration office rules now state that "trekkers are not allowed to trek in the notified areas previously known as restricted". Rather than get involved in all this semantic complication, the term "restricted" is used here to refer to places that are closed to trekkers, or open to trekkers only when accompanied by a policeman (a liaison or "environmental" officer). There are many reasons why the restricted areas exist. In most cases, it is a hangover from a time when the border with China was more sensitive than it is now. Environmental groups, particularly the Nepal Nature Conservation Society, are pressuring the government to keep some places closed for ecological reasons to avoid both cultural and environmental degradation. Because trekkers require assistance when something goes wrong (accident, illness or theft), the government restricts some areas because it doubts that it could provide the security that trekkers need. There are also political reasons for some restrictions. In the 1970s, for example, the Jomsom trek was closed because a major foreign-aided military operation had been mounted there in support of the Khampas in Tibet. There are many influences on the decision to open or close certain parts of Nepal to foreigners. Recent changes have liberalised both trekking and climbing, and there is considerable pressure to open more areas to trekkers. You should check with a trekking agency or the central immigration office before planning an unusual trek. Fees for treks to restricted areas range from US$70 per day (with a 10 day minimum) for Mustang to US$90 per week for Humla and Manaslu. You must also pay for a Nepal government official to accompany you throughout the trek. A trek to a restricted area must be arranged as a fully equipped organised trek through a registered trekking agency using tents, sherpa staff, cooks and porters. The trekking agency arranges the permit through a series of applications, guarantees and letters, a process that requires about two weeks and can be started only 21 days before the arrival of the group. You may not trek alone; there must be at least two trekkers in each group. For some areas there is a limit to the number of trekkers per season. There is no system of advance reservation, and no clear indication of what will happen if the quota is reached the day before you make an application. Each group is assigned an "environmental officer" who will accompany it during the trek. Despite the fancy name, what you will get is a Nepalese policeman who you must equip, insure and take on the trek. The liaison officer is supposed to handle all the formalities with police and government offices en route. This trek was officially opened to tourists in 1991, but mountaineering expeditions have long had access to the area. In 1950 a party led by H W Tilman trekked from Thonje to Bimtang and Colonel Jimmy Roberts crossed the Larkya La looking for an interesting mountain to climb. Manaslu (8156 metres) was attempted by Japanese expeditions every year from 1952 until 1956, when the first ascent was made. Having become known as a "Japanese mountain", much of the information about the area was available only in Japanese. The Japanese continued to dominate the climbing scene on Manaslu until 1971. A few trekkers, including the peripatetic Hugh Swift, managed to obtain trekking permits for the region, but otherwise this trek has always been the domain of the mountaineering expedition. Though the Larkya La is not a difficult pass, the trek is harder than most in Nepal. In many places the walls of the Buri Gandaki Valley are perpendicular, so you cannot walk along the bottom of the valley. There is a huge amount of wasted climbing involved during the first part of the trek as you climb up and down over ridges or onto shelves to bypass cliffs. The trail is rough and steep and it often literally hangs on a bluff high above the river. Don't read any further if you have the slightest tendency towards acrophobia. The trek is remote and has no rescue facilities or opportunities to bail out if you are tired. There is only one facility that might conceivably be called a trekkers' hotel, and as late as AS 1992 there was not a single English signboard between Arughat and Tilje. The trek is geographically spectacular and culturally fascinating. The Tibetans of the upper Buri Gandaki, a region known as Nupri ("the western mountains"), are direct descendants of Tibetan immigrants. Their speech, dress and customs are almost exclusively Tibetan. There is still continuous trade between Nupri and Tibet; Chinese cigarettes, for example, are found more frequently than Nepalese cigarettes. The mountain views in Nupri are sensational, and the Larkya La is one of the most dramatic Himalayan pass crossings. In May 1993 the governments of Nepal and China reached an accord that allowed the first treks across the border between the two countries. While it had been a route for Nepalese pilgrims for years, foreign trekkers were never allowed to trek from Nepal into Tibet. The journey through Humla, Nepal's highest, northernmost and most remote district, is culturally and scenically rewarding. The people of northern Humla are Bhotias whose roots are in Tibet and who still enjoy the freedom to graze their animals on the Tibetan plateau. The upper Humla Karnali Valley is also populated by Bhotias who trade extensively with Tibet in traditional ways that have totally vanished elsewhere. It is only near Simikot, the district headquarters, that you will encounter people of other ethnic groups, mostly Thakuris and Chhetris. 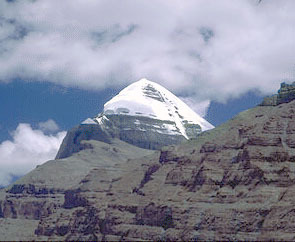 A trip to Mt Kailas has always been regarded as a pilgrimage. It satisfies the romantic in us that the pilgrimage to Kailas is a difficult one. Whether you drive for seven days or walk for six days, it is still not possible to make a quick, easy visit to Kailas and Manasarovar. You cannot yet travel all the way to Kailas by helicopter or airplane. This is certainly as it should be. Contents copyright © 1995, 2001 trekinfo.com. All rights reserved.